Businesses spend millions of dollars on marketing campaigns to drive engagement and promote action from website visits, inbound calls, and in-store purchases. But with close to 75% cart abandonment, window-shopping, and the rise of digital aggregators, the real challenge lies in successfully converting these interested and engaged prospects into customers. For Direct Marketers, the constant struggle to prove the worth of your advertising, not to mention the fierce competition with your digital competitors, means that you have a limited window to make a connection that drives action. And the high cost of direct mail compared to email or digital means that poor targeting, irrelevant messaging, and lack of measurement can mean the difference between a conversion and a missed opportunity. Email Marketers, although now sitting very close to digital with advancements in measurement and targeting are still competing on a large scale within the consumer’s inbox. Once the mark is missed on a connection, getting back into that inbox can be an uphill battle, especially with all of the compliance and SPAM rules and regulations now in place. Digital Marketers don’t have it any easier however. Even with programmatic advertising driving down costs and improving accuracy, the rapid change of consumer information combined with the great complexity of the omnichannel landscape have required a large investment in technology to simply keep up. All while proving ROI and tracking consumers across screens becomes even harder to obtain. The common thread that binds all marketers, however, is the need to acquire more customers at a lower cost. To turn a lead into a customer you need to first understand who that consumer is, what are they interested in, and are they worth engaging with. Answering all of these questions requires marketers to not only correctly identify a lead, but also qualify and accurately target that prospect across all channels. Crafting the right message is also imperative in gaining the attention of your target. An offer that is relevant as well as timely is necessary to ensure that your leads stay fresh and take action. Neustar Omnichannel Remarketing™ provides all marketers with the tools necessary to find and convert high quality leads across more channels with greater precision. Targeting: Append enriched intelligence including demographic, behavioral and geographic attributes to deliver targeted offers to your most interested prospects and customers. Activation: Create and deliver compelling and relevant engagement across email, social media, mobile, direct mail, display and addressable TV. Attribution: Close the loop with comprehensive analytics to accurately measure campaign performance including sales lift, audience profiles, conversions, and attribution. Site visits: We’ll work with you to set pixels on all of your relevant pages, and then enable cookies to track your visitors who have expressed an interest in your brand. Inbound calls: You provide us with the phone numbers and we’ll do all the work. Within 24 hours of receiving your phone log, Neustar will have your campaign up and running delivering targeted promotions to the qualified prospects that matter most. 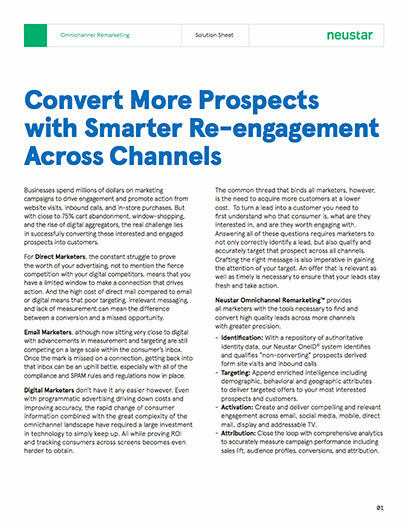 Omnichannel engagement: Qualify and target hand raisers using enriched customer intelligence. Neustar provides advanced segmentation and scoring to allow you to focus on the prospects that matter. Deliver the right message to the right customer at the right time across online, direct mail, email, social, and addressable TV. You’ve effectively driven qualified traffic to your website, but did those hand raisers purchase? Keep your brand in front of these prospects to stay top of mind and bring them back to complete their purchase and turn them into a customer. Neustar ties online engagement to offline identity to deliver relevant promotions across to your web visitors across all channels after they leave your site. Most call centers try to identify inbound callers based on telephone numbers. But many do not have systems or incentives in place to capture and verify detailed attributes about a caller if they don’t buy anything. Nor do they have the ability to remarket to that potential customer. Neustar creates an actionable lead list from your daily phone log using our comprehensive repository on U.S. consumer and business data, allowing you to re-engage with that prospect when they’re most interested. In a highly competitive environment, potential customers that have shown interest should be on your hot prospect list for immediate follow-up. Whether calling, clicking a banner or visiting your web site, these visitors have demonstrated a true interest. By effectively reengaging with the right message delivered to the right leads on the right channels you‘ll be able to make a lasting connection and provide the nudge that’s needed to turn prospects into customers.